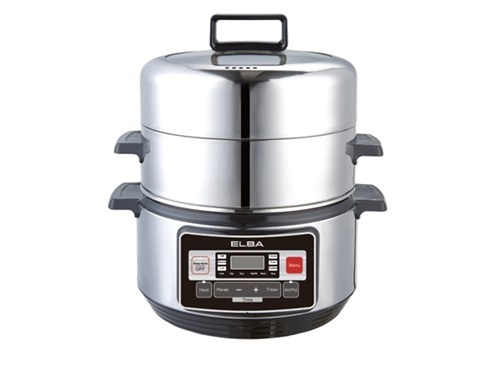 2-tier steamer suitable for steam, boil, braise, keep warm, reheat or used as a hotpot. Consists of 304 stainless steel inner pot, 1 pc concentrator for steamer, 1 pc steamer tray with handle, 1 pc steam plate, 1 pc water tray and 1 pc stainless steel lid with transparent window. Steamer racks helps to cook or steam more dishes simultaneously. 3 temperature settings: High, medium or low. 60 minutes timer setting with digital control. With anti dry boiled protection. 320mm ultrawide stainless steel body.